A new study based on data from the final orbits last year of NASA's Cassini spacecraft shows the rings of Saturn -- some of the most visually stupendous objects in the universe -- are far more chemically complicated than previously was understood. During Cassini's 'Grand Finale' plunge into Saturn's innermost ring and upper atmosphere in 2017, the mass spectrometer aboard the probe sampled chemicals at altitudes between Saturn's rings and atmosphere. Political humorist Mark Russel once joked, "The scientific theory I like best is that the rings of Saturn are composed entirely of lost airline luggage." Well, there's no luggage, it turns out. 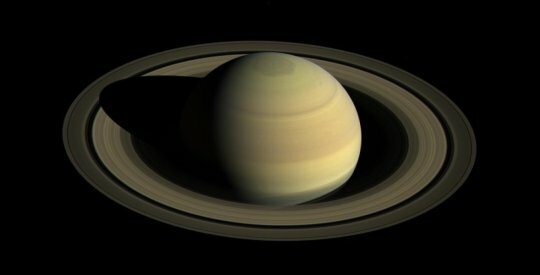 But a new study appearing in Science based on data from the final orbits last year of NASA's Cassini spacecraft shows the rings of Saturn -- some of the most visually stupendous objects in the universe -- are far more chemically complicated than previously was understood. Furthermore, the paper shows the innermost D ring of the gas giant is hurling dust grains coated in its chemical cocktail into the planet's upper atmosphere at an extraordinary rate as it spins. Over long timescales, the researchers say this infalling material may change the carbon and oxygen content of the atmosphere. "This is a new element of how our solar system works," said Thomas Cravens, professor of physics & astronomy at the University of Kansas and a co-author of the new paper. "Two things surprised me. One is the chemical complexity of what was coming off the rings -- we thought it would be almost entirely water based on what we saw in the past. The second thing is the sheer quantity of it -- a lot more than we originally expected. The quality and quantity of the materials the rings are putting into the atmosphere surprised me." Cravens is a member of Cassini's Ion and Neutral Mass Spectrometer (INMS) team. During Cassini's "Grand Finale" plunge into Saturn's innermost ring and upper atmosphere in 2017, the mass spectrometer aboard the probe sampled chemicals at altitudes between Saturn's rings and atmosphere. More than simply water, the INMS found the rings to be composed of water, methane, ammonia, carbon monoxide, molecular nitrogen and carbon dioxide. "What the paper is describing is the environment in the gap between the inner ring and upper atmosphere, and some of the things found were expected, such as water," Cravens said. "What was a surprise was the mass spectrometer saw methane -- no one expected that. Also, it saw some carbon dioxide, which was unexpected. The rings were thought to be entirely water. But the innermost rings are fairly contaminated, as it turns out, with organic material caught up in ice." A further new finding from Cassini's mass spectrometer showed large amounts of the chemical brew from Saturn's D ring is flung into the planet's upper atmosphere by the ring spinning faster than the planet's atmosphere itself. "We saw it was happening even though it's not fully understood," the KU researcher said. "What we saw is this material, including some benzine, was altering the uppermost atmosphere of Saturn in the equatorial region. There were both grains and dust that were contaminated." Cravens said the findings could cast new light on mechanisms underpinning our solar system as well as other solar systems and exoplanets -- and also prompt a host of new scientific questions. "This could help us understand, how does a planet get rings? Some do, some don't," he said. "What's the lifetime of a ring? And what's replenishing the rings? Was there a time when Saturn didn't have rings? How did that composition get into there in the first place? Is it left over from the formation of our solar system? Does it date back to proto pre-solar nebula, the nebula that collapsed out of interstellar media that formed the sun and planets?" According to Cravens, the higher-than-expected rate of material being expelled from Saturn's D Ring into the planet's upper atmosphere, or ionosphere, is sufficient that astronomers now think the lifespan of the ring may be briefer than previously estimated. "Because of this data, we now have shortened the lifetime of inner rings because of the quantity of material being moved out -- it's much more than we thought before," Cravens said. We know that it's bumping material out of the rings at least 10 times faster than we thought. If it's not being replenished, the rings aren't going to last -- you've got a hole in your bucket. Jupiter probably had a ring that evolved into the current wispy ring, and it could be for similar reasons. Rings do come and go. At some point they gradually drain away unless somehow they're getting new material." Assisted by KU graduate and undergraduate students, a first stage of Cravens' work involved sorting and cleaning raw data from Cassini's INMS instrument. "The raw data came through from our instrument on Cassini to deep-space antennas to NASA's Jet Propulsion Laboratory and then to computers at the Southwest Research Institute in San Antonio where Hunter Waite, the first author, is based," he said. But Cravens' main contribution involved interpreting that data with a focus on how materials from the rings are altering Saturn's ionosphere. Cravens and his colleagues report the influx of chemicals from the rings change Saturn's equatorial ionospheric chemistry by converting the hydrogen ions and triatomic hydrogen ions into heavier molecular ions, depleting the planet's ionospheric density. "My interest was in the ionosphere, the charged-particle environment, and that's what I focused on," Cravens said. "This gunk coming in chews up a lot of the ionosphere, affects its composition and causes observable effects -- that's what we're trying to understand now. The data are clear, but explanations are still being modeled and that will take a while. The material is coming into Saturn at high speeds because the rings are moving faster than the atmosphere quite a bit. It doesn't just drop in gently. It comes flying in there like a satellite re-entering our own planet. These dust grains moving at satellite speed, depositing energy that can dissociate the atmosphere. Per atom, it's pretty energetic stuff because of the speed differentiation between the rings and the atmosphere. We think it may be heating the upper atmosphere, changing its composition."